Combined universities rescue team leader Steve Glassey (centre in white gloves) discusses search tactics with members of the Taiwan Special Search and Rescue Team in Christchurch last week. 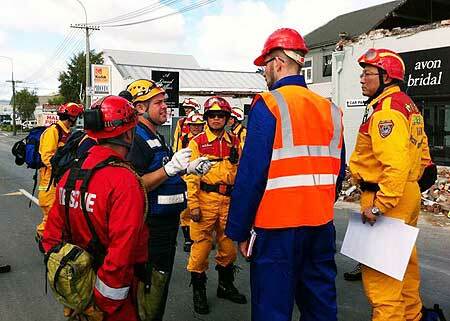 Steve Glassey, a senior tutor at the Joint Centre for Disaster Research, is back at the University’s Wellington campus after several days in Christchurch leading a combined universities search and rescue team. Mr Glassey is a former United Nations disaster management officer and is responsible for the development of many aspects of the New Zealand Urban Search and Rescue programme, including the national disaster search dog programme, response team accreditations systems and national training frameworks. Mr Glassey also worked with disaster specialists from Victoria and Canterbury universities, several of whom are graduates of Massey’s Diploma in Emergency Management, as well as search and rescue personnel from Taiwan in the days following last Tuesday’s disaster. Since Thursday they have cleared more than 600 homes in the suburb of Richmond and worked with the Taiwan team near the CBD to search buildings and provide first aid.